In my last post I outlined the basis for my HS2 response, a key part of which is the availability of a better option - HC Midland, where HC is High Capacity, not High Speed. This blog provides a bit more detail. A key problem with HS2 is that the ultra high speed of 400kph limits the capacity to 12 tph (trains-per-hour). HS2 Ltd believe that this number if 14 tph or 18tph, but even if the technical ability is found to run more trains than anywhere else in the world at this speed, it doesn't leave any room for recovery when things go wrong. As a nation, we should build new infrastructure on this scale with some room to grow. Some have pointed out that 24 to 30 tph is possible in the central London sections of Crossrail and Thameslink, and wonder why not the same on HS2? Well, it is about safety - as speed rises, it takes longer to stop and so a greater gap between trains is needed. These greater safety margins also therefore result in fewer trains-per-hour. The faster the trains are, the fewer can be run each hour. Since the great problem is capacity on the railways, ultra high speed makes no sense. Thus, HC-Midland would be targeted at a top speed of 155mph or 250 kph. This lower speed then means that trains can stop more quickly, and be closer together, probably increasing the maximum trains-per-hour to 18 without major technical issues. The real question though is why go via the M1? A key reason is because it is an established transport corridor rather than a mostly green field route, and we should prefer existing transport corridors where possible. It is important to note that it will not always be possible to route beside a motorway, but frequently it is. More important in this case is that the routing between the Midland and West Coats main lines allows far more connections to be made for more local/regional travel. This converts the investment from being one where there are no real benefits along the route, to one where value can be seen and understood. The key components to this are the new regional links that are created, not just national ones. At the heart of HC-Midland is individual sections that can be invested in separately. While the whole proposal is shown together on the map, it would not be built in one go, but instead created as money became available. Each section also has a smaller price tag. To aid understanding, this blog has a map referred to from now on. It is important to realise that this map is at the highest possible level with no detail implied, and is only intended for the purpose of this blog. The key section is Northampton to north of Luton, section E on the map, which follows the M1 closely with tunnels for Northampton south and Newport Pagnell. This one section provides a vital new transport link for the area as well as longer distance services, allowing commuting or business travel between Northampton and Luton, or between Luton and Coventry, far easier access to Birmingham from Luton and St.Albans, plus new connections to Birmingham, Luton and Gatwick Airports. A station at Newport Pagnell would probably also be justified. These new journey options are based on my assessment that there will be a little more space on the Midland main line than on the West Coast main line over the next few years. Thus the goal of this one new section is to move Northampton to London commuters to travel via Luton with comparable or better journey times, potentially into Thameslink. A Newport Pagnell station would also extract traffic from Milton Keynes. Both reduce pressure on the West Coast main line. The second key section is Northampton to Leicester, section H on the map (with three broad possible route alignments, including one that simply reopens the old line to Market Harborough). This section provides new local connections between Northampton and Leicester, but also far easier access from Milton Keynes and Watford to Nottingham, Derby and further north. For example, one recommended route on the current network from Milton Keynes to Sheffield is via Stockport in the south of Manchester!. These two sections are probably justified in their own right, even if HS2 goes ahead - the regional and national connections made are valuable enough. However, the problem still remains of increased London capacity. The HC-Midland proposal uses spare railway land between West Hampstead and Mill Hill Broadway (section C) and a mostly M1 route with tunnels at Mill Hill, Brickett Wood and Luton (section D) to provide the essential capacity into London. A short tunnel from West Hampstead (section A) would allow access to Euston. For Birmingham, sections F and G provide enhancements to the existing line from Northampton with some new sections (various route options). Notably, the work to provide 4 tracks between Rugby and Birmingham is needed anyway, irrespective of HS2. 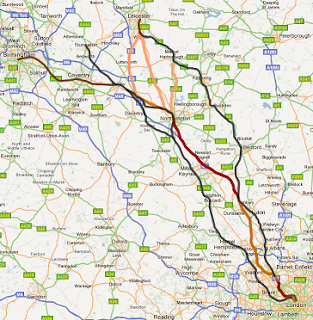 It is easy to look at the map and think this is simply a straightforward alternative to HS2 on a different route. But that would be a huge mistake. Firstly, the lower top speed of 250 kph is more appropriate for the UK, putting the focus on high capacity instead. Secondly, the core routing between the Midland and West Coast main lines can follow the M1 to minimise damage from development and noise. Finally, the real gain is in the huge number of new regional links created, rather than just national ones. If you believe this is a good approach for investing in UK rail, why not leave a comment! 4. Javelin trains linking onto existing routes bringing benefits for local residents. I think the 200MPH+ and 18TPH concepts are pie in the sky at the moment and that 180MPH running is perfectly reasonable now and in 2030. Even Japan Rail assumes Shinkansen speeds will be the same when they finally get high speed running all the way to Sapporo by the mid 2020s which is the same distance between London and Aberdeen I believe. So I agree that fast is fast enough and focus on maximising capacity and here I'm thinking about the Classic Convertible services that will cover the north of England and Scotland via HS2. I think there would be a business case for examining upgrading the WCML north of its link to HS2 to take double decker trains. Some reasonable ideas here. I think a line speed of 155-186mph is appropriate for UK geography. The idea would need to be further developed in order to show how it would improve speed and capacity to other destinations such as Manchester, Leeds, Liverpool, Newcastle etc. In other words more work needed to show how route would link into EMCL, WCML and also HS1. The post also does not mention the loading guage of the proposed route. I believe that it should be designed to the same loading guage as HS1 and should allow good direction connections to European desitinations from major regional cities. @Anonymous1, Sounds like Arup and my views are pretty similar, no surprise as they are common sense. Its the local train benefits that really help to win hearts and minds of residents. @Prestwick, the UK loading gauge is a long way from being able to take double deck trains, so it would be a massive cost. More significant is the disruption to the working railway. Closing the line every weekend for a couple of years isn't appealing. @Anonymous2, HC-Midland is about capacity increase more than speed & time saving. As a first estimate, journey time London to Northampton looks like it would be equal or slightly better than via MK. Extensions would certainly be possible through the Trent Valley, along the Midland Main Line, or to the east of Leicester, but they are problems with less urgency. The HS1 link can be made via Primrose Hill as with the HS2 plan. Any new line in the UK would be HS1/Euro gauge unless there was a big reason not to.